Fee's Little Craft Studio: How Do You Store Your Projects ? How Do You Store Your Projects ? How do you store your ongoing projects? I store mine in little folders in this basket. There are 7 in here at the moment. 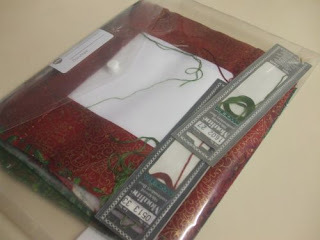 Each one contains everything that I need for each project including the pattern, threads etc. This is Gail Pan's BOM - When I first started it I stitched all of the blocks ready for hand stitching when the patterns are released. I also store the embroidery threads in here as well. I find that this system works well for smaller projects which need hand work. 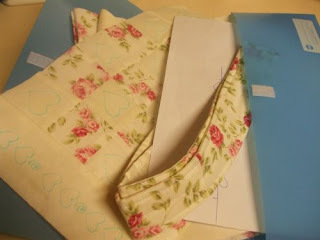 I like to hand stitch of an evening so it is easy just to grab a project folder and stitch away. So how do you store your ongoing projects? 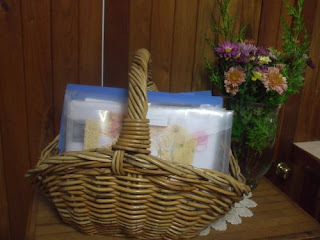 And whilst you are surfing around take a look at Jeanette's give away at Serendipity Design to celebrate her 50th post. I love your idea and just might steal it,especially the one about making the squares up for Gail Pan's BOM. 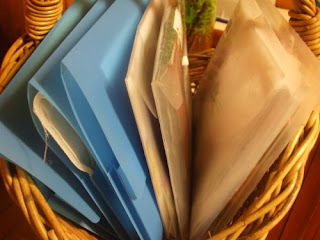 At the moment I store my projects in plastic storage bags. Mine are scattered all over the place, I need to get better organised. All my stitchery Boms are stacked in a pile on a corner of my desk. Hmmm need to go basket shopping! Well, before we packed up the house, I stored each project in a large ziplock bag with the threads needed and patterns etc, then hung it on a skirt hanger in my hall cupboard. I did a post about it early in the year. :-) You are like me, organised! I store mine in similiar style...mine are kept in flat plastic containers stacked on top of each other in the Bookcase in my SRoom...like You I like to be Organized...couldn't live any other way..lol. oh, this is a scary subject for me! I tend to store my projects in bags ;-) You know the green type bags that come from the grocery stores now. Pattern, fabric, accessories etc. all go into the bag for a future project. i store my little stitcheries in folders similar to yours and anything bigger in any type of bag i have around . I've read all the good ideas on here. I tend to use one bag for everything and this is becoming too messy. I'm going to try one of these suggestions! Good old gallon ziplock bags work great for me. One bag each holds my projects until I get to them. I tend to cut out a bunch one day, package them in the bags and sew them as I get a chance. Mothers Cupboard - On Line Store - OPEN ! !